Our October meeting saw the return of Dougal Urquhart, ranger at Cudmore Grove, with a talk on “African Medley”. Dougal and his wife have made four trips to Africa over the last 7 years visiting Gambia, Namibia, Ethiopia and Morocco. He has a passion for bird watching and nature in general preferring to stay at eco-lodges along the way. He showed us a collection of slides of birds including the Red Billed Fire Finch, Grey Heron, Osprey, Red Billed Hornbill and Flamingo, to name but a few. He was also able to show us the rare Ethiopian Wolf which very much resembled a Fox. Dougal is an excellent speaker and all enjoyed the evening tremendously. Our next get together is on the 24th November and there is a change to our programme Jackie Marshall-Ward will give us a talk on “Upstairs, Downstairs”. Visitors are welcome at a cost of £5.00. Details of all our meetings and speakers can be found on the diary of the home page of the Winstred 100 website. If you would like further information about P.A.W.S please ring either of the following committee members: Alice Holmes 01206 735510 or Jane Anderson 01206 735505. 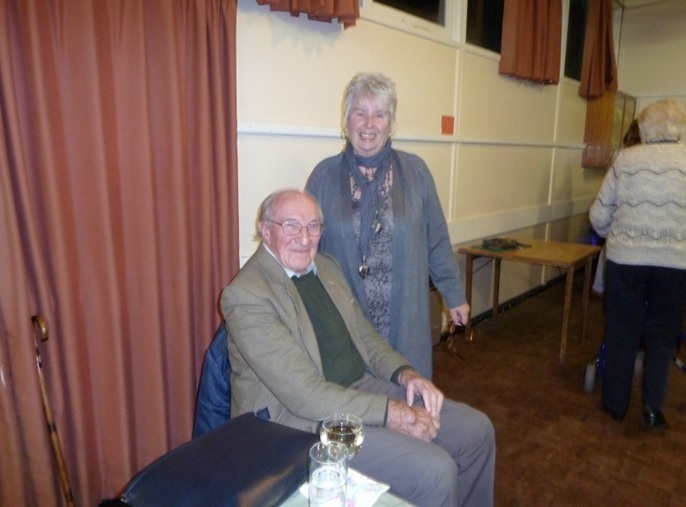 Sue Kidd and Edward Lubbock came along to our September meeting and told us all about the joys and disasters of Hot Air Ballooning. They both got into ballooning in the mid-80s and are now the proud owners of their own balloon G-SUED. They explained that, like an aeroplane, you have to have a licence to fly a balloon and have to go through extensive training to get it. It is necessary to know the laws relating to flying a balloon, about the weather, how a balloon is put together and how to deal with emergencies. They explained that there are two types of balloon; those with hot air produced by a burner and those filled with hydrogen or helium. Gas balloons are smaller and rounder than hot air balloons and more likely to explode! The biggest dangers to a balloonist are pylons and mist, although less so since the advent of GPS systems. Balloons come in many shapes and sizes and are often used for advertising. We all enjoyed this fascinating insight into the world of balloons. 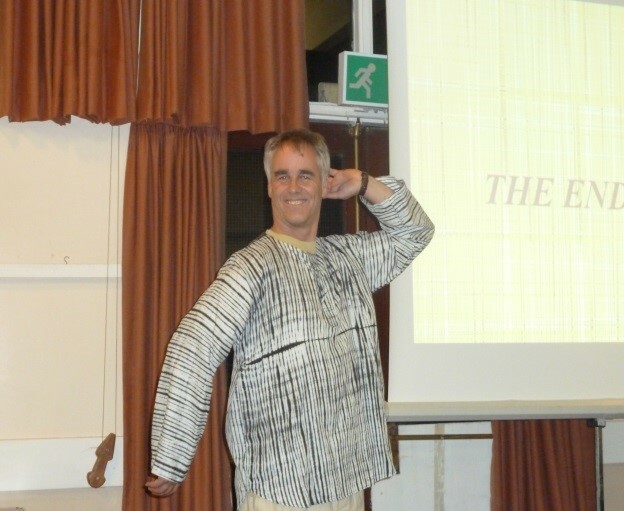 Our next get together is on the 27th October when Douglas Urquhart returns with his talk on “African Medley”. I am sure that most of you will have heard the sad news about Sue Copeland’s untimely death on the 15th August. 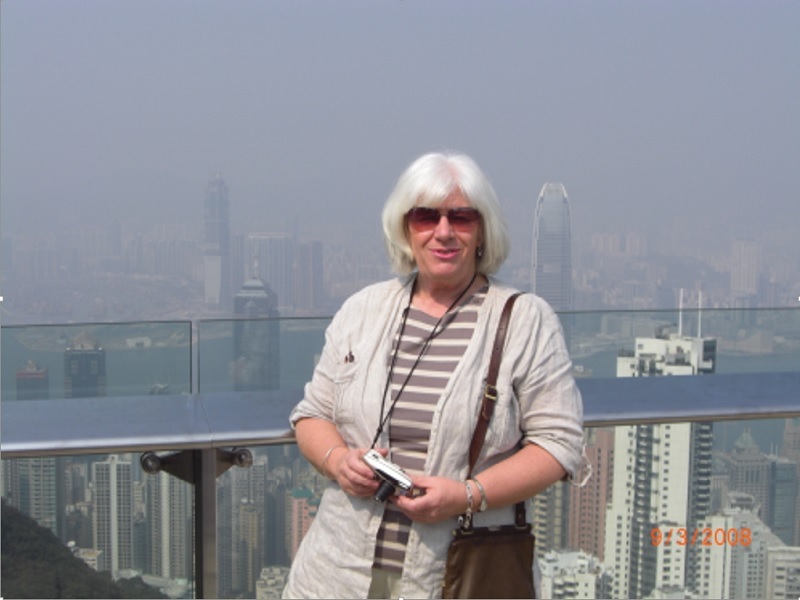 Sue was a member of Peldon, Abberton & Wigborough W.I. for many years and indeed a founder member of PAWS. Let’s remember Sue with a smile and the return of smile to us from a very talented, love for life lady. Someone you can say, I am so very pleased to have known her. Sue was a wonderful, clever, sparkly lady and we will miss her. I didn’t know Sue very well but know how much she meant to many people in PAWS. I remember when I first met her she was so friendly and kind. We will all miss her so much. She was always so happy and smiling, a really lovely lady. Lots of lovely memories of a very special lady. Sue was always so cheerful and hardworking for so many causes, so full of sensible and new bright ideas, all held together with such a wonderful sense of fun and humour. I am sure that we all have fond memories of her care and wonderful sense of fun. Thank you Sue, it was a pleasure to have known you. Our next get together is on the 22nd September when Edward Lubbock and Sue Kidd will tell us about “Hot Air Ballooning”. Visitors are welcome at a cost of £5.00. Details of all our meetings and speakers can be found on the diary of the home page of the Winstred 100 website. If you would like further information about P.A.W.S please ring either of the following committee members: Alice Holmes 01206 735510 or Jane Anderson 01206 735505. 41 members and 2 visitors attended our July annual social night. This year’s theme was the “Mad Hatter’s Tea Party”. 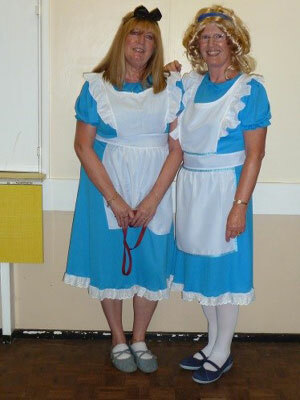 This was an opportunity for those who wished to dress as their favourite character from ‘Alice in Wonderland’ or ‘Alice Through the Looking Glass’ to do so and indeed they did. A collection of rabbits, mad hatters, the queen of hearts and 2 Alices to name but a few arrived early, “Not late” for another lovely evening. There was themed tea party food including sandwiches and a variety of cakes washed down with a “Drink Me” bottle of fizz and I’m glad to report we did. 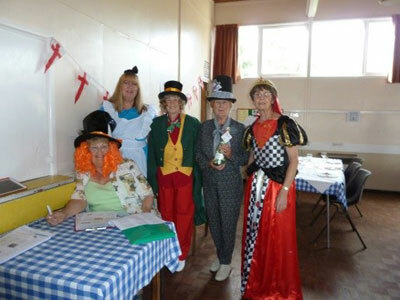 There were 3 quiz’s to be completed, the joint one was won by the team consisting of Helene Gooding, Jean Hicks, Pam Leggett, Marianne Smith, Wyn Oxton and Caroline Wilson with 17 points out of a potential 20 and the best dressed was awarded to Jean Hedger as the outstanding “Mad Hatter” of the night. 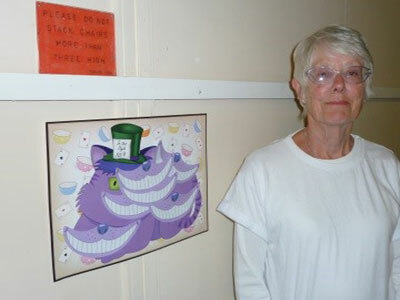 Also the game “Pinning the moustache on the Cheshire Cat” was won by Angela Clark. As we don’t meet in August our next get together is on the 22nd September when Edward Lubbock and Sue Kidd will tell us about “Hot Air Ballooning”. Membership is currently full but visitors are very welcome at a cost of £5.00. 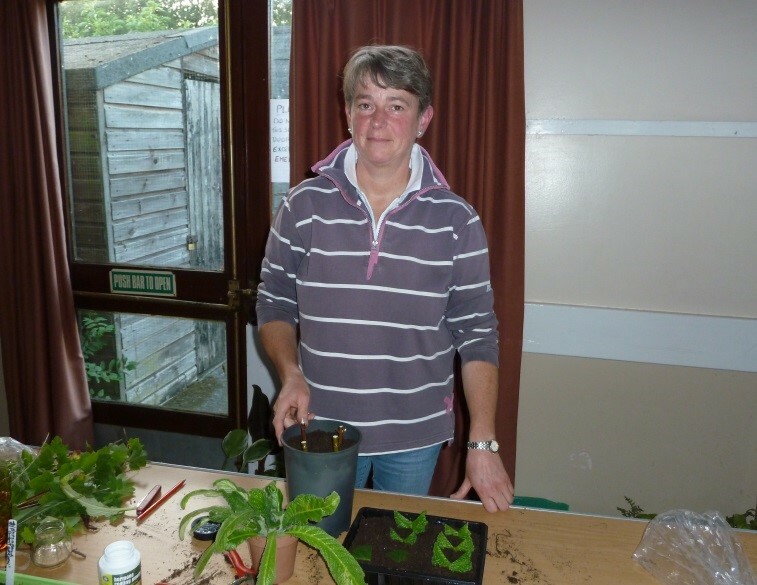 39 members and 1 visitor attended our June meeting when Chris South came along to give us a talk and demonstration on “Masterclass in Propagation”. Chris tutors at Elmstead Market and was very knowledgeable and passionate about horticulture. She showed us the best way to sow seeds (most of us sow too many) and a number of cuttings. She also showed us how it was possible to take several cuttings from one leaf of a houseplant. Even the most avid gardener amongst us felt that we learnt a great deal and I’m sure lots of people will now be trying out her ideas. Our next meeting is on 28th July and is our annual social night. This year’s theme is “Mad Hatters Tea Party”. This is an opportunity for those of you who wish to dress as your favourite character from ‘Alice in Wonderland’ or ‘Alice Through the Looking Glass’ or please just come and enjoy the evening. There will be Themed Goodies to eat and Drink, Quizzes and of course a Raffle appropriate to the occasion. Have you considered making a ”Mad Hat” to wear to the Party – there’s a thought…………….. Cost to non-members is £5.00 and we would appreciate knowing in advance to assist with catering. Contact numbers are below. 39 members and 1 visitor attended our May meeting when Tina Oldfield gave us a talk on “Trek for Life.” Tina’s daughter was diagnosed with Breast Cancer in 2004 at the age of 24 having been told on 3 occasions that it was nothing to worry about. She fought the disease for 2 years before dying at the age of 26 leaving behind a husband and 2 young children. To help with her grief and to do something in her memory Tina and 3 others decided that they would do the challenging “Trek for Life” to Everest Base Camp. After 13 months of training, obtaining sponsorship and equipment from companies like Rock Face they set off in the Easter Holidays of 2006. She showed us slides of the various basic lodges they stayed in along the way together with the incredible landscape and birdlife. Their two porters carried their equipment and clothing which they needed as they climbed to higher altitudes and their guide mapped out their route. At various times they suffered with altitude sickness and found it difficult to even eat (apart from Mars bars which never posed a problem) and supplemented their meagre diet. At just 500 meters from Base Camp they got snowed in and upon the advice of their guide that it would be impossible to continue in the time that they had allocated for this trip they had to go back down. It was just as well they took the advice as they heard that 3 Sherpa’s had died in a landslide the next day. However there and then they made a pact to come back the following year to complete the walk that they had begun and indeed successfully completed it then. It was an amazing feat and something we all thought was fantastic. Tina continues to raise money for breast Cancer and, on this occasion, she is donating half her fee to the Nepalese Earthquake cause. 39 members attended our April meeting when Mrs Denise Hammond-Webb took us on a journey from Suffolk to Ontario,Canada. Her great, great, grandfather, Nathaniel Hammond was born in Chelsworth, Suffolk on 8th March, 1851 and was the 6th child of ten. He grew up to be a farm labourer and married Charlotte Hollocks in 1875. They both lived in a tied cottage on a farm in Semer which funnily enough was called Canada cottages. As their family grew, huge changes in mechanisation on farms were sweeping the country and many thousands of agricultural workers were no longer needed. George, the 8th child of Nathaniel & Charlotte, decided to try his luck in Canada. At the time adverts were everywhere offering grants for free land and assisted ship passages with great opportunities in Canada & Australia. In September 1912 his father Nathaniel & Charlotte with their three youngest children followed George to Ontario and settled in a village called Thamesford. Very sadly both Nathaniel and Charlotte died of the Spanish Flu epidemic in 1920. Over 500 million people worldwide died of the Spanish Flu. However their children went on to become successful landowners and dairy farmers in Thamesford and now also grow wheat, hemp, tobacco and produce maple syrup. 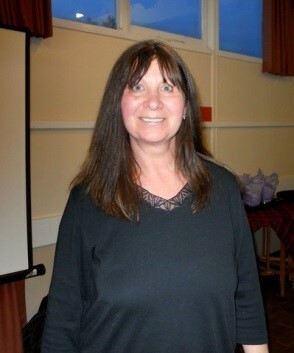 Our next meeting is on May 26th when we will hear about “Trek for Life” with Tina Oldfield. 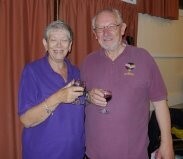 46 PAWS members attended the March meeting which was also their AGM. As well as the business of the evening, whereby the committee and President were elected, we also enjoyed a “sweet supper” together with a quiz, a chocolate tasting and Easter Bonnet competition. Two of the existing committee stood down with one new member, Kate Neville, being elected and Sue Copeland was elected President with Pam Foakes as Vice-President for the forthcoming year. Bouquets were presented to Gen Fretwell, the outgoing President and Jane Banks and Julia Dymond as a thank you for all their hard work on the committee over the years. The winner of the Easter Bonnet was Diane Cornes (photo right). 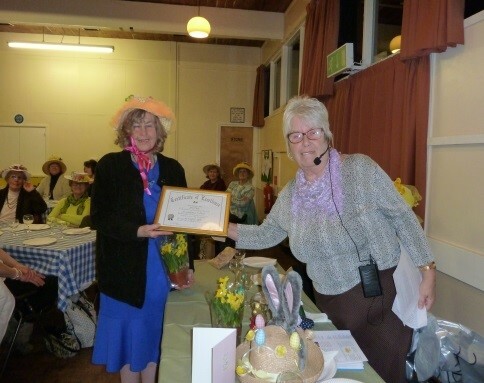 Jean Hedger (photo right) was also presented with a certificate in recognition of all her hard work on the Sales Tables. Chris Mutch, our speaker, talked to us about the benefits of Magnetic Therapy in a piece of jewellery and did a hefty trade afterwards. 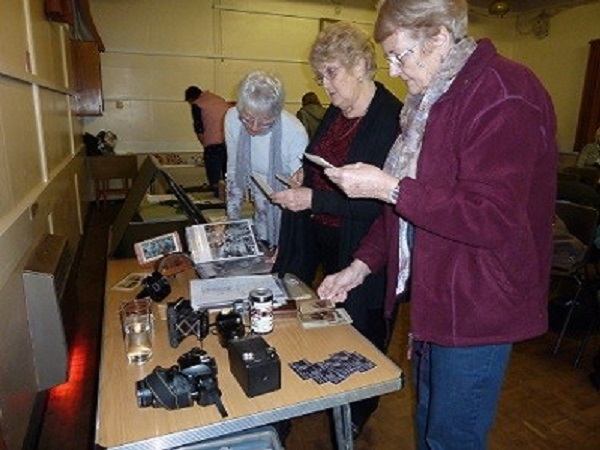 41 of us attended the February meeting to hear Chris Farndell’s talk on Photography – Crime Scene to Art. Chris is an ex Colchester Police Officer who for the last 17 years of his career in the force was a Scene of Crime Officer. This involved photographing evidence to assist with the prosecution of cases. This proved to be very diverse covering road accidents, personal injuries, graffiti, fires, footprints and fingerprints etc. He had numerous slides showing us some of the cases he had been involved in. After retiring from the Police Force he taught Photography at 6th form college in Colchester. He showed us a number of beautiful photographs in and around Venice showing how different apertures and exposures resulted in stunning photos. He also had a selection of cameras and photos for us to look through. He was a really interesting speaker and his talk was enjoyed by all that were there. Our next meeting is on the 24th March and is a closed meeting as it is our A.G.M. We will be having a Chocolate Tasting, Cake Sampling and a Quiz. There will also be a prize for the best Easter Bonnet. Membership is currently closed but visitors are welcome (other than the A.G.M.) at a cost of £5.00 which includes refreshments. 44 Members, including our 2 most recent, were joined by 3 visitors when we welcomed back our speaker John Lilley “The Storyteller” at our recent January meeting. It was a busy night with membership being renewed and then John relayed a number of amusing stories, antidotes, rhymes and poems relaying how the “British like small pleasures” as written by Bill Bryson’s Notes from a Small Island and other references to Pam Ayers, Parish Magazines etc. There were a lot of laughs from the appreciate audience. The next meeting is on 24th February when Chris Farndell will talk on the subject of “Photography – Crime Scene to Art”. Membership is currently closed but visitors are welcome at a cost of £5.00 which includes refreshments. Details of all meetings and speakers can be found on the diary of the home page of the Winstred 100 website. If you would like further information about P.A.W.S please ring one of the following committee members: Alice Holmes 01206 735510, Jane Banks 01206 735004 or Jane Anderson 01206 735505.